↑ The official British history gives an estimated figure of 156,115 men landed on D-Day. This comprised 57,500 Americans and 75,215 British and Canadians from the sea and 15,500 Americans and 7,900 British from the air. Ellis, Allen এবং Warhurst 2004, পৃ. 521–533. 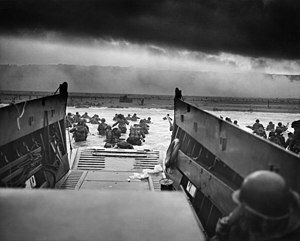 ↑ The original estimate for Allied casualties was 10,000 overall, of which 2,500 were killed. Research underway by the National D-Day Memorial has confirmed 4,414 deaths, of which 2,499 were American and 1,915 were from other nations. Whitmarsh 2009, পৃ. 87.